C.1915, Ansonia Clock Co, "CROWN" crystal regulator in generally fair to good condition, with restoration. Note this clock has been sprayed over with an antique gold paint, and the fancy spelter finial on top is bent slightly to one side. Also both bottom nuts are missing from the pendulum. 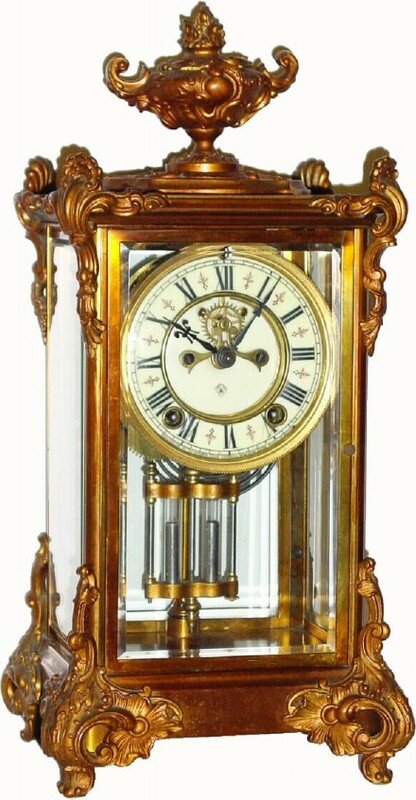 The porcelain dial and open escapement movement are in good condition, and the clock would restore OK. The man who consigned this particular clock is dreaming, and taking up catalog space that belongs to clocks in better condition; he should now have the message. Height 15 1/2"